As a provider of quality hand crafted Christe Eagle Parts we take pride in offering the best products we can offer. We are dedicated to serving the needs of our customers each and every day. Life at Davis Aero Parts, Inc. It all started when Benny Davis completed his first Christen Eagle in 1990. His passion for the Eagle was reflected by his expert craftsmanship and attention to detail. As a result, he earned many awards and the respect of his peers. Life in Corydon Iowa was perfect for inspiring Benny's many innovations for the Eagle. Such as the easy to install Rudder Cable Shortener. Many other products that lighten, strengthen and increase the p erformance of the Eagle would follow. With an airstrip on his property, he can test his designs. Benny continues to enjoy flying, and finds the time most days to take up his old reliable Cub. 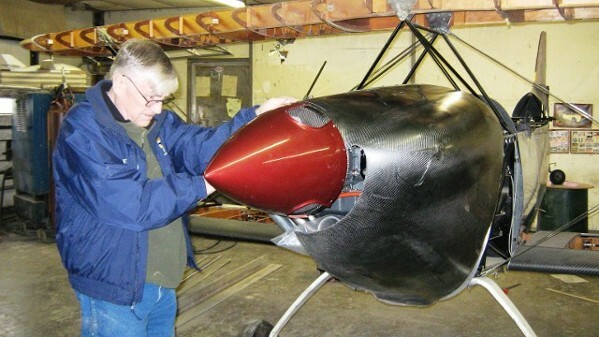 Larry Prosser is a fine pilot in his own right in addition to being the machinest whose precisionwork is part of our success. Only the highest quality is accepted; anything less is discarded as inferior. 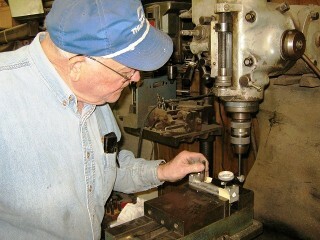 Here he is working on Titanium parts using a gauge to ensure precision in his work. Cindy K. is the Administrative Assistant and Carbon Fiber Fabricator. She makes all those pieces such as instrument panels and various fairings, pilots seats and with help from the rest of the staff the cowlings. She also handles all email for the shop.